Looking for an engaging and educational way to get your kids into digging, planting and watering? Try Good Growing: A Kid’s Guide to Green Gardening from activity-book publisher Klutz. The pages are packed with kid-tested projects that are universal to all climates and gardens — from suburban backyards to city windowsills. Each copy comes with seeds to get the garden started; and beyond green thumbs, eco-friendly tips are sprinkled throughout from a 1989 Klutz title, Kids Gardening, which won the Natural Resources Defense Council International Eco-Award of Excellence. Good Growing: A Kid’s Guide to Green Gardening hits bookstores on March 15, 2010 and is now available for pre-order on Amazon.com. Looking for an engaging and educational way to get your kids into digging, planting and watering? 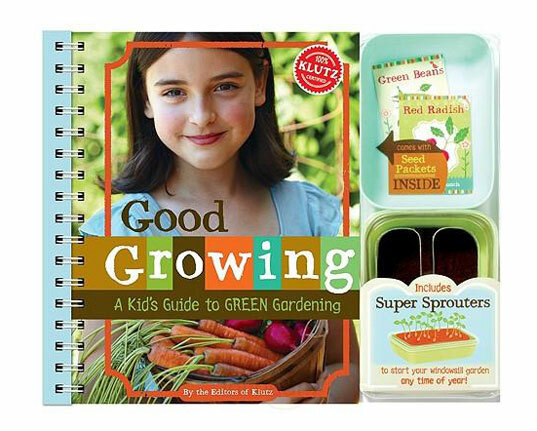 Try Good Growing: A Kid's Guide to Green Gardening from activity-book publisher Klutz. The pages are packed with kid-tested projects that are universal to all climates and gardens -- from suburban backyards to city windowsills. Each copy comes with seeds to get the garden started; and beyond green thumbs, eco-friendly tips are sprinkled throughout from a 1989 Klutz title, Kids Gardening, which won the Natural Resources Defense Council International Eco-Award of Excellence. Good Growing: A Kid's Guide to Green Gardening hits bookstores on March 15, 2010 and is now available for pre-order on Amazon.com.